According to the fake news BBC, large parts of the world had record warmth last year. Note the big red splodges on the BBC map across S America, Africa and the Pacific, where there is virtually no data at all. This is why it is called man-made global warming! It is certainly “extreme and unusual”, because it actually has not happened. ← When will the Science Minister ask some hard questions about the global warming cabal that’s got him in their pocket? Just at first glance you can see cooling in Australia and South America was magically converted into heat; and how temperatures are estimated for Africa is beyond me. The joys of gridding. Making up temperatures for those where there are none based on temps hundreds of miles away. A bit like applying the temp in London or John O’Groats to the whole UK. My diaries tell me that the last time the11th. Jan fell on a Wednesday was in 2012. Don’t you mean ” 2016″ ? Sorry folks got it all wrong. The BBC map is correct for Jan to Dec 2016. Not sure what the problem is on that score. The BBC globe is for just January 2107. At the risk of sounding like a broken record ….. Although Matt McGrath is supposed to be a ” science correspondent” as well as an “environment correspondent”, he never does any checking of the nonsense that he regurgitates. O/T I think but in searching for something else I found a report in the South Australian Chronicle Sat. 21/3/1891 of a renewed blizzard in the South of England with temperatures recorded at minus 17.8℃. It noted 60 persons drowned (50 on one steamer). indicates that the weather wasn’t wonderful. Is that what Lord Kelvin meant by ‘quantitative science’? Wrong map, Wrong dates, is that fake news, total incompetance, or just lying. All three? Plus illiteracy; he official NOAA document contains the phrase “majorly influenced”!!!!! What? 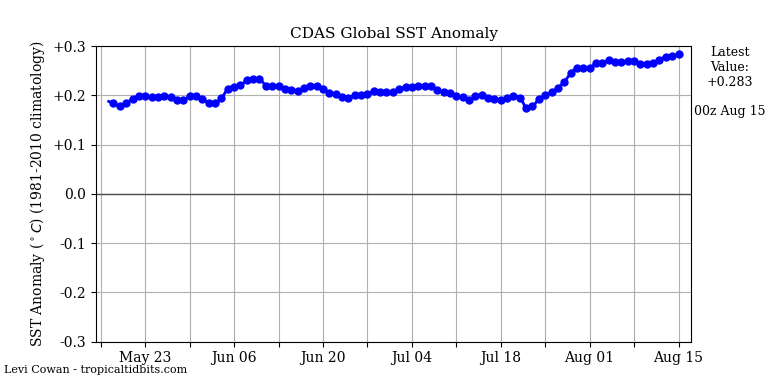 So December’s anomaly is BELOW an anomaly from six and a half years before? Where is the beef? In so far as it is a rehash of “2016 hottest year evah,” it is not news. In so far as it insinuates 2017 is definitely on-track to replace 2016 as “hottest year evah” or even to be similar, it is fake. We always knew that 2016 would be milked as the poster-boy for AGW, largely ignoring the influence of El Nino. That milking will go on for a long time, even though – in terms of information theory – there is nothing further which can be added about it. We also know that the terrestrial-based measurements will be fiddled just enough to produce, over time, a series of spurious records. Thus, the NOAA series claims a rate of increase of + 0.17 C a decade since 1970, while RSS claims + 0.135 C a decade. Of course, in either case, why should we care, when the brightness temperature of the Northern Hemisphere cycles up and down 14 C every year? It does appear that the maps/charts might be dealing with different things. That said, the point made with regard to extrapolation has merit. It is an inescapable fact that there is little actual measurement of much of the globe, Measurements are patchy and there are spatial coverage issues. Much of the presentation of this data is based upon infilling the accuracy of which is moot. Surely there can’t be many dumber than Gummer? “……A public body, funded by the taxpayer to the tune of £3.8m a year, discharging such a crucial role requires competence, honesty and objectivity. The committee’s recent report on energy prices is deficient in all three, instead displaying similar ethical standards to Greenpeace or Friends of the Earth……..
Will OFCOM’s role in regulating the BBC which starts in April be helpful in stemming this BBC misinformation trail and if so should the readership here, have a plan to involve them ? Similar role keepers seem to be duty bound to record the number of complaints received and presumably act on those where complainants numbers are high. “The WMO’s statement on the 2016 climate leaves no room for doubt. The much-hyped warming hiatus is over – and the ‘missing’ heat energy didn’t go missing at all. Instead, that heat went into the ocean, and we got much of it back again last year,” said Dr Phil Williamson, from the University of East Anglia. So apparently Dr Williamson can tell all of that from a single El Nino year, because he is so sciencey. Ah, the irony of making utterly unproven, unsubstantiated and unscientific claims whilst insulting those who disagree with you, and claiming you are the upright, true scientist. University of East Anglia delenda est! Well stated, bea (aka Cato the Elder). Instead of the Punic Wars, you now face the “Puny Wars” with the BBC. I had to laugh at the “Carthago delenda est.” My 2 years of HS Latin comes in handy for more than being a plant taxonomist. I suspect this was merely a sloppy error but the graph heading should have been included. Strangely, when “Global Land Temp Percentiles Map” is selected from the drop down box on the NOAA web page, the map for Land & Ocean Percentiles is displayed. Of course the other question is, why does the BBC need so many “environment correspondents/analyists”, such as McGrath, Harrabin and Shukman, (to name but three) peddling the same “climate change” propaganda? I have noticed this duplication in much of the BBC’s output recently. And, in 1998 NCDC told us that the average temperature was 59°F. Same as NASA/GISS in 1995. The mean global temperature seems to be increasing in an almost linear fashion since the LIA. Mean temperatures are increasing at a rate somewhere between 0.6 and 1.2 Deg K / century depending on the data used. The pause is difficult to understand against history, but probably is a reminder that nature is non-linear. While the increase has the noise factor that is normal weather on top of it, it is surely to be expected that records will be regularly broken as the slope is positive. The lie underlying all this hype is that it is man who is to blame not the sun / earth interactions, and that computer models are more than models. When I was a schoolboy, back around the time of Bill Haley And The Comets, my Geography teacher said that CO2 from industry would turn the South of England into the French Riviera . I am still waiting for the food to improve. I note that this part of rural Eastern Virginia had record (ever?) heatness despite the fact that we never once came close to 100F let alone the 107F we had a year or two ago when we didn’t apparently have record heatness. Or was that a record then but not any longer because it’s now cooler? It’s so difficult to tell with record weathers. Anyway: update from our local “early Spring”: overnight temperature last night 24F. Night before 28F (so the trend is cooling. If it keeps on like this (-4F/night) we’ll soon be back to normal.) diurnal 40F with a nasty North wind – typical January temperatures. Still looks & feels a lot like Winter around here. I’m beginning to think NOAA isn’t all that reliable when it comes to analysing weather. “Temperatures are extreme and unusual. ~clunk! Temperatures are extreme and unusual, ~clunk! Temperatures are extreme and …. We’ll have to leave there because as is usual with the BBC, the record’s stuck. To a mathematician or statitician, the word “extreme” is not unusual – or frightening. For fun, sometimes we call them extremums. Tiziano Vecelli gazed into the mirror at the still form before him. “Umm, a staticTitian” he observed.